This was the first official day of the rendezvous. The weather was terrible with rain and wind all day, but since all events were inside it was not a problem. I spent all morning demonstrating our CD-ROM program "What to Expect Cruising America's Great Loop" to attendees as they lined up to register and buy stuff. Sales were brisk and Eva Stob had to reorder more CDs 3 times. 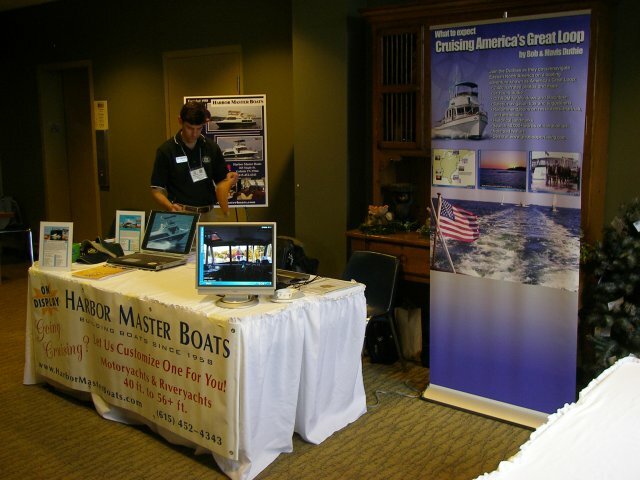 I shared a table with Irving Martin from Harbor Master Boats (see photo). It was great to hear comments from people that had bought it before. One man has been through all 6 hours of the program three times. Several people were buying second copies to give to relatives so they wouldn't have to take pictures. Another couple is unable to finish the loop and wants to see the part they missed. At 1:00PM I demonstrated the program to about 100 people in a group. A speaker from Minneapolis presented his plan to build floating condominiums on 4 connected self powered barges that will cruise the river system. The project is being funded with pre-sales and is very well thought out. It will be interesting to see how it goes. A third speaker spoke on bio-diesel which seems to have great advantages especially in how it will clean out all the sludge in your fuel tanks the first time you use it. It also has no diesel smell with even as little as 5% bio-diesel (made from soy beans) mixed with petroleum diesel.